24 year old lass from Asuncion, Egni Analia Almiron Eckert recently crowned as the new Miss Universo Paraguay 2012 held at the Sheraton Asuncion Hotel in Asuncion last May 18. Egny stands 183cm tall and competed before in Miss World 2010. She will now represent the country in Miss Universe 2012 on December. 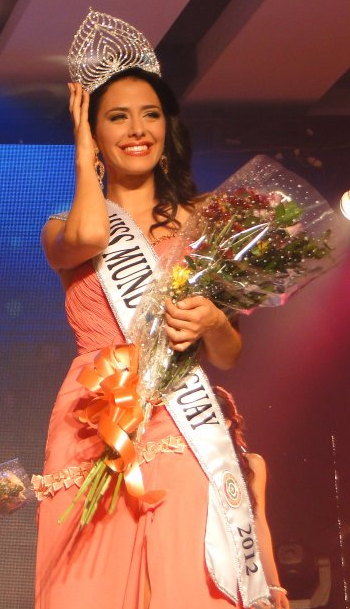 Crowned as Miss Mundo Paraguay 2012 was the stunning Fiorella Migliore Llanes from Asuncion. She is a former Italia Nel Mundo 2008 titleholer. 23 year old Fiorella stands 172cm tall. She will travel to Ordos, Inner Mongolia in China to compete for the Miss World 2012 beauty competition on August 18. 21 year old Nicole Elizabeth Huber Vera also from Asuncion was declared the winner of Miss Internacional Paraguay 2012. She stands 175cm tall and will enter the Miss International 2012 contest in Okinawa, Japan on October. Meanwhile, Alexandra Fretes was elected as Miss Tierra Paraguay for the 2nd time (she won the title last year but was unable to travel to the Miss Earth 2011 venue, the Philippines), and will now compete in the Miss Earth 2012 pageant to be held in Indonesia on October. Liliana Santa Cruz will compete in Miss Continente Americano next October in Ecuador. Nadia Servian will compete in Miss Bikini International in Tianjin China on August.